During your first ballroom lesson, your instructor will say it’s just like learning any new skill. And they’re correct. You’d be surprised at the similarities between learning a box and picking up a club. Take a look below. Everyone can dance, but only a brave few take lessons to polish this talent. The same goes for golfing. Anyone can take a whack and send that little white ball flying, but only those who have trained can make it onto the green. Even more so, only those who have thoroughly trained can make it into the hole. This can be equated to silver and gold level students who can navigate the dance floor like the back of their hand. You have to be prepared with the essential equipment to before starting a new hobby. In learning to dance, your program supplies that. For golf, you go to your bag. What’s in there? Multiple tools designed to help you excel. A golf bag contains different clubs built for specific parts of the course, and a dance program teaches you different dances for unique social situations. There are clubs for teeing off, putting and sand traps. Likewise, there are dances for weddings, clubs, and rodeos! Waltz is the oldest ballroom dance of them all, meaning all other dances were born from it. The golf equivalent? The driver. Specific situations call for the driver as well as the Waltz. Both the driver and the Waltz call for power and finesse, which results in powerful movement. Yet to wield this power well requires good posture, balance, and timing. Swing, on the other hand, is everywhere. East Coast, West Coast, Lindy, Jive, the list is endless. This versatility carries over in golf to the 5 iron. With your 5 iron in hand, you can work through a number of situations. Creating gateways is another similarity between the Swing and the 5 iron. Just like how a 5 iron can open you up to use other irons, Swing can prepare you for other rhythm dances. Usually, when someone says ballroom, everyone thinks of Foxtrot. It’s impossible to get through a night of ballroom dancing without dancing the Foxtrot. 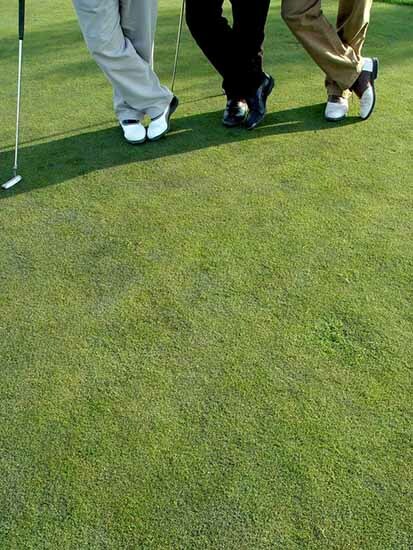 Likewise, it’s impossible to get through a round of golf without using your putter. Both the Foxtrot and the putter are an easy way to start out. There are multiple levels of difficulty to choose from in golf. A set of tees for Championship level play, and a set of tees for more casual games. Ballroom dance has the same options. Want to perform on Dancing With The Stars? Learn some gold figures. More interested in dancing socially? Try out our Social Confidance Program. Similar to the different colors of tees, the different levels in your dance studio are meant to present you with different challenges. On that note, there is nothing wrong with changing your level once you start. Not only is it good to have multiple goals, you’ll learn more information at a faster pace. Don’t believe us? Check out our YouTube channel for clips on all types of ballroom dances! Also, don’t forget to check out our blog for weekly updates and inspiration!